Epiphany Cardiography Products, LLC, in conjunction with Mortara Instrument Inc., announces that Cardio Server now supports modality worklists (MWL). This capability enables bi-directional communication of patient orders and demographics between the Epiphany Cardio Server and Mortara diagnostic cardiology devices. With modality worklists, demographic and order information from the HIS (Hospital Information System) or EMR (Electronic Medical Record) can now be securely transferred between Epiphany’s Cardio Server and Mortara’s complete line of networked ELI™ electrocardiographs, X-Scribe™ Stress, and H-Scribe™ Holter devices. The use of MWL improves workflow through the elimination of manual data entry. Mortara Instrument, Inc. was founded nearly 30 years ago and today is a recognized technology leader in the world of ECG. Mortara’s global headquarters is located in Milwaukee, Wisconsin with operations in Australia, Germany, Italy, the Netherlands, and the United Kingdom. Mortara is distinguished in the field of non-invasive cardiology for innovations that are the core of the company's complete line of ECG products including electrocardiographs, stress exercise systems, Holter systems, data warehousing solutions, and cardiology monitoring systems. The company manufactures and distributes its ECG devices and related technologies worldwide. Mortara’s market leadership is a result of its substantial investment in R & D which has fueled the introduction of many new Mortara products uniquely positioned to benefit customers in their everyday use of diagnostic ECG devices. To learn more about Mortara Instrument and its expanding product portfolio visit http://www.mortara.com. Founded in 2004, Epiphany Cardiography Products simplifies the collection and management of diagnostic test results. Epiphany’s Cardio Server is a web-based, user-friendly management system application that receives, manages, and exports diagnostic test results to EMRs. Cardio Server communicates with over 100 devices, from over 40 vendors, in 15 diagnostic modalities. With over 350 hospital customers in the US and abroad, Epiphany is committed to serving its customers’ needs through product innovation and the delivery of exceptional service with an unwavering dedication of driving open systems. To learn more about Epiphany or Cardio Server, please visit http://www.epiphanycardio.com. 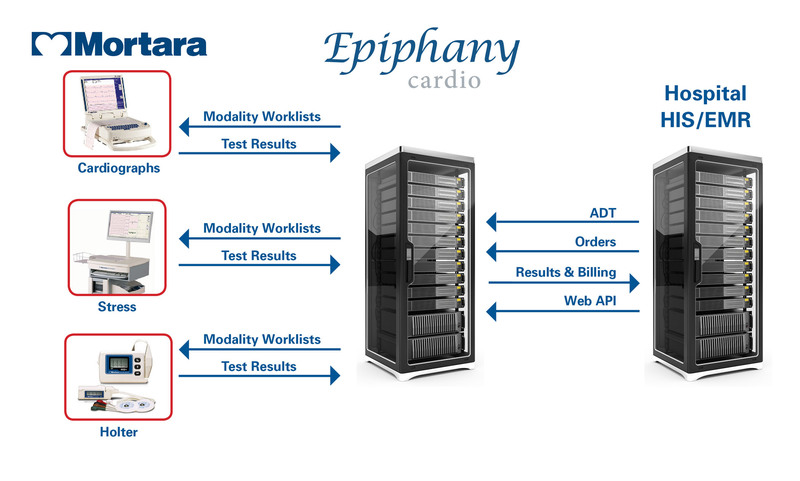 Mortara/Epiphany Modality Worklist DiagramModality Worklists enable bi-directional communication of patient orders and demographics between the Epiphany Cardio Server and Mortara diagnostic cardiology devices.